On March 2, 2003, near-surface winds carried a large amount of Saharan dust aloft and transported the material westward over the Atlantic Ocean. 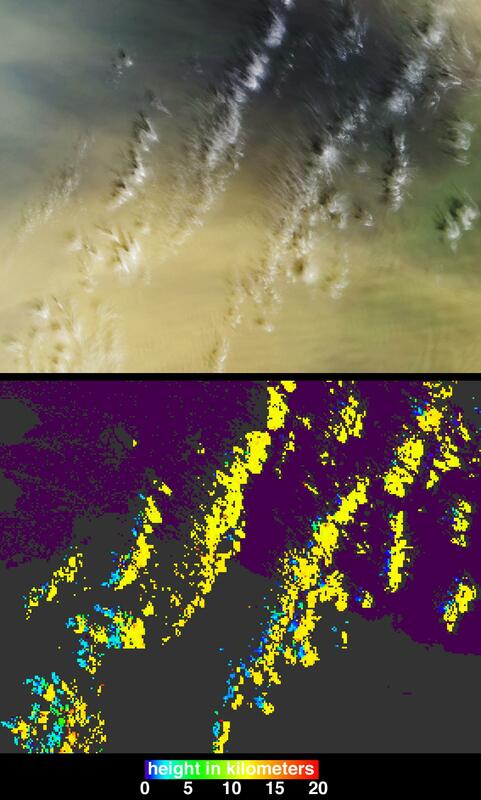 These observations from the Multi-angle Imaging SpectroRadiometer (MISR) aboard NASA's Terra satellite depict an area near the Cape Verde Islands (situated about 700 kilometers off of Africa's western coast) and provide images of the dust plume along with measurements of its height and motion. Tracking the three-dimensional extent and motion of air masses containing dust or other types of aerosols provides data that can be used to verify and improve computer simulations of particulate transport over large distances, with application to enhancing our understanding of the effects of such particles on meteorology, ocean biological productivity, and human health. MISR images the Earth by measuring the spatial patterns of reflected sunlight. In the upper panel of the still image pair, the observations are displayed as a natural-color snapshot from MISR's vertical-viewing (nadir) camera. High-altitude cirrus clouds cast shadows on the underlying ocean and dust layer, which are visible in shades of blue and tan, respectively. 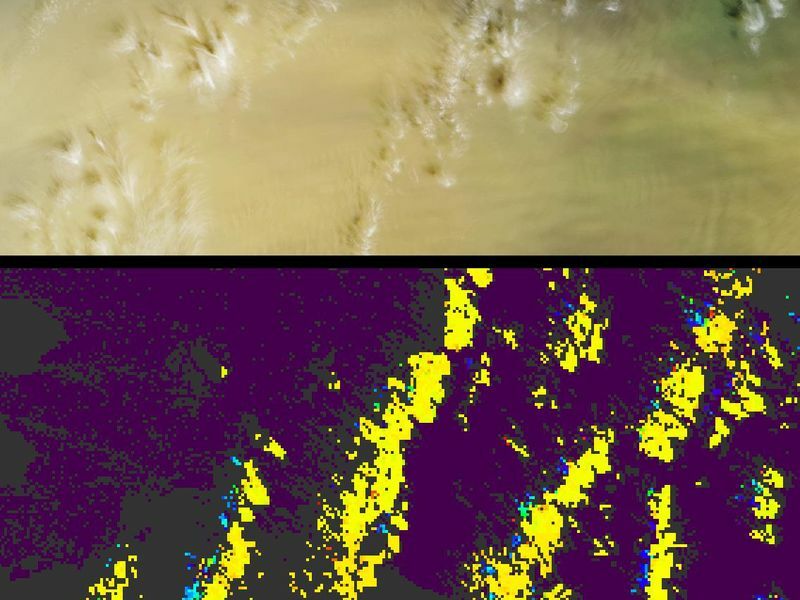 In the lower panel, heights derived from automated stereoscopic processing of MISR's multi-angle imagery show the cirrus clouds (yellow areas) to be situated about 12 kilometers above sea level. The distinctive spatial patterns of these clouds provide the necessary contrast to enable automated feature matching between images acquired at different view angles. For most of the dust layer, which is spatially much more homogeneous, the stereoscopic approach was unable to retrieve elevation data. 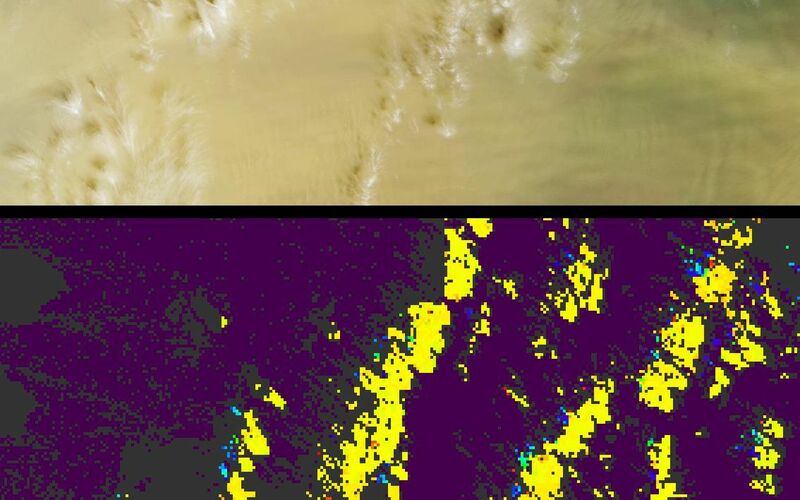 However, the edges of shadows cast by the cirrus clouds onto the dust (indicated by blue and cyan pixels) provide sufficient spatial contrast for a retrieval of the dust layer's height, and indicate that the top of layer is only about 2.5 kilometers above sea level. Motion of the dust and clouds is directly observable with the assistance of the multi-angle "fly-over" animation (Below). The frames of the animation consist of data acquired by the 70-degree, 60-degree, 46-degree and 26-degree forward-viewing cameras in sequence, followed by the images from the nadir camera and each of the four backward-viewing cameras, ending with 70-degree backward image. Much of the south-to-north shift in the position of the clouds is due to geometric parallax between the nine view angles (rather than true motion), whereas the west-to-east motion is due to actual motion of the clouds over the seven minutes during which all nine cameras observed the scene. MISR's automated data processing retrieved a primarily westerly (eastward) motion of these clouds with speeds of 30-40 meters per second. Note that there is much less geometric parallax for the cloud shadows owing to the relatively low altitude of the dust layer upon which the shadows are cast (the amount of parallax is proportional to elevation and a feature at the surface would have no geometric parallax at all); however, the westerly motion of the shadows matches the actual motion of the clouds. The automated processing was not able to resolve a velocity for the dust plume, but by manually tracking dust features within the plume images that comprise the animation sequence we can derive an easterly (westward) speed of about 16 meters per second. These analyses and visualizations of the MISR data demonstrate that not only are the cirrus clouds and dust separated significantly in elevation, but they exist in completely different wind regimes, with the clouds moving toward the east and the dust moving toward the west. The Multi-angle Imaging SpectroRadiometer observes the daylit Earth continuously and every 9 days views the entire globe between 82 degrees north and 82 degrees south latitude. 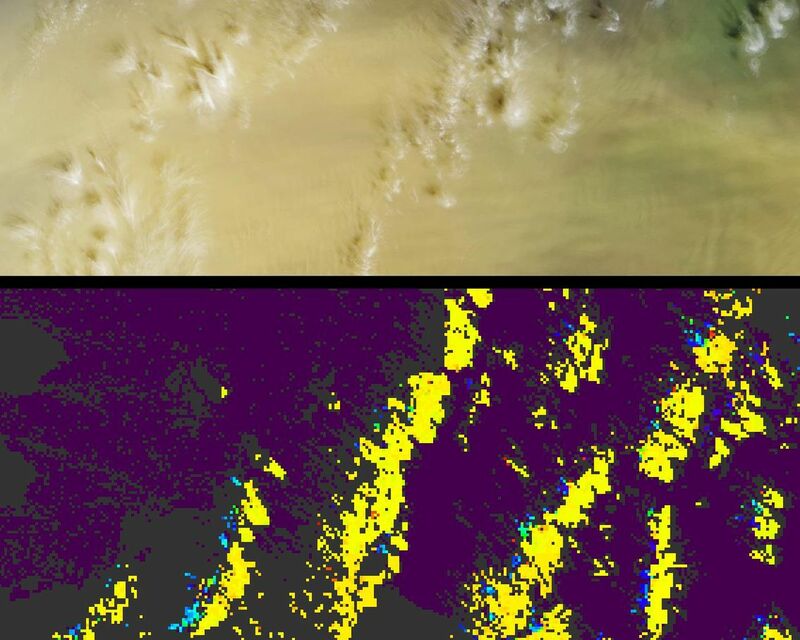 These data products were generated from a portion of the imagery acquired during Terra orbit 17040. The panels cover an area of about 312 kilometers x 242 kilometers, and use data from blocks 74 to 77 within World Reference System-2 path 207. MISR was built and is managed by NASA's Jet Propulsion Laboratory, Pasadena, CA, for NASA's Office of Earth Science, Washington, DC. The Terra satellite is managed by NASA's Goddard Space Flight Center, Greenbelt, MD. JPL is a division of the California Institute of Technology.